Alfred's Basic Mandolin Method has been updated, revised, and improved. 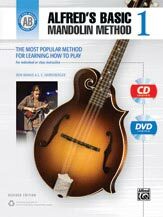 It features clear, well-paced instruction for beginning mandolin students. Learning to play has never been easier or more fun than with Alfred's Basic Mandolin Method---the best choice for today's beginning mandolin students. The CD and DVD include performances by expert instructor Jared Meeker.